Transport chair accessories and wheelchair add-ons are important considerations when it comes to customizing wheelchair gear for a specific user. From swing-away footrests to elevating leg rests, we carry cool accessories for wheelchairs that increase both function and comfort. Lap trays provide a handy surface that's strong and rigid and perfect for reading, eating or using your laptop computer. Our half lap trays, designed for use with any wheelchair, flip up and out of the way for easy patient transfers. Other manual wheelchair accessories include a selection of secure, comfortable patient armrests with wide Velcro straps to hold the arms in place. Leg amputees will find comfort and relief from any of our special cushions designed to provide support and protection for their residual limb(s). Other handy wheelchair accessories include carry packs and oxygen cylinder carry bags that attach conveniently to the back of the chair and special foot and calf protectors to prevent dragging feet. Quick-Release Amputee Kit is a amputee cushion for Wheelchair with seat pan or rigid insert. DuraSoft Padded Lap Tray for Wheelchair with vinyl cover for easy cleaning. Quick attachment to full length or desk length arms, easily removed for transfers. Comfort Company Swingaway Amputee Cushion allows quick wheelchair transfers. Swingaway Amp has Solace Cover, incontinent polyurethane fabric with multi-directional stretch. Comfort Arm provides a comfortable and secure resting place for patient arm. Forearm and elbow are completely padded and have VELCRO straps to hold arm in-place. Comfort Company 2002-PAD has options. Comfort Arm Low-Profile, choose from 3 lengths. Provides a comfortable, functional armrest. Arm platform has VELCRO straps to hold arm in-place. Comfort Company 2004-PAD has options. Comfort Arm Tall Style has support on one-side only. Armrest measures 22"L x 7"W and provides a comfortable armrest. Arm platform has VELCRO straps to hold arm in-place. Comfort Company 2007-PAD has options. Comfort Company Molded Armrest . Armrest measures 21"L x 6"W and provides a comfortable armrest. Comfort Company 2300-PAD has options. Calf Protector for wheelchair footrest. Fits 16-22" wide wheelchairs. Calf Protector provides padded support and prevents feet from dragging. Comfort Company Elevating Single Foot for wheelchair elevating legrest. The Elevating Single Foot provides pressure relief and comfort. Includes footplate pad. Comfort Company Complete Feet for wheelchair. Complete Feet attaches with easy to use belt or bolt-on. Optional Leg Separator available. Prevent skin breakdown around heel area and provide a comfortable footrest for any wheelchair with footrests installed. Comfort Company DuraSoft Half Tray for Wheelchair for users who do not need full lap tray. The Half Tray has padded, vinyl covered tray. Quick attachment to full length or desk length arms, easily removed for transfers. Comfort Company EconaSoft Lap Tray for Wheelchair was designed to provide users a lightweight, economical lap tray. Webbing strap attachment allows for easy adjustment and removal. Comfort Company Flip Up Half Tray for Wheelchair was designed to provide users a lightweight, economical lap tray. Best for those users who need a non-contoured tray that can be easily moved. Offset Door Hinges adds 2" clearance to existing doorway. Ideal for wheelchair users. Universal Oxygen Carry Bag for wheelchairs. Fits D & E Cylinders. Wheelchair Side Pouch hangs on arm of any wheelchair. Oxygen Carry Bag for standard wheelchair fits E & D Cylinders. Invacare Hemi Swingaway Footrests for Wheelchair. Fits Tracer IV, Tracer EX2, Tracer SX5, SX5 Recliner, 9000 XT wheelchairs. Invacare Hemi Elevating Legrests (ELR's) for wheelchair. Fits Tracer IV, Tracer EX2, Tracer SX5, SX5 Recliner, 9000 XT with himi-spacing. Hanger pin spacing 1.5". 24" Replacement Wheel & Handrim for Invacare 9000XT, 9000SL, 9000XDT Wheelchairs. Sold each, chrome or composite handrim. Invacare Wheelchair Swingaway Footrests. Fits older model Tracer and 9000 series wheelchairs. For chairs with 3.5" hanger pin spacing. Invacare Elevating Legrests (ELR's) for older Invacare wheelchair. Fits Tracer series, 900 & 9000 series with wider (3.5") pin spacing. Invacare 1034352 replacement front caster wheels for At'm power Chair. Invacare 1144033 replacement rear wheels for At'm power Chair. 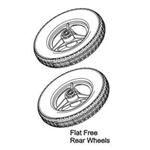 Flat-free rear wheels sold by pair, 2.25" wide x 12.5" diameter. Replacement parts for Invacare TRHD22FR Heavy-Duty Transport Chair. Jay Adjustable Solid Seat is a drop seat base that provides solid foundation for wheelchair cushions. The firm cushion base will provide improved posture and positioning. Wheelchair Seat Belt w/Auto Style buckle fits any chair with screw-on seat upholstery. Firefly Electric Power Drive attaches to the front rigging of a fixed front-end wheelchair. Cannot be used with swingaway footrest. Lithium battery powered electric motor has a 15 mile driving range with speeds up to 12MPH. Firefly Electric Power Drive Lithium Ion battery pack. Use as replacement or spare battery.